The other night I was irretrievably grumpy (I know what you’re thinking: “You, grumpy!? Surely not!”). I suddenly remembered that when I was grumpy as a teenager, which was often, I used to light all the candles I owned and lie in my room and listen to music. So that’s what I did this night. And it worked. Grumps cured, at least for now. 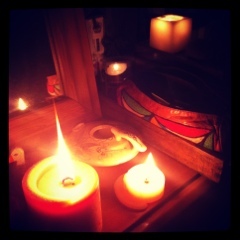 This entry was posted in memory, music, Rambling and tagged candles, fix, grumpy, solution, Teen by avocadoandlemon. Bookmark the permalink.